Installing gas appliances in the home, unfortunately, is not as simple as just hooking up the gas and starting your appliances. Instead, it is essential and often required by local building codes that you install certain sizes of pipe. This requires installing both the proper length and the proper diameter of pipe, in the approved type of piping material. Water heaters and other gas appliances must have the right pipes to operate correctly. The factors used to determine the size of piping for all four major appliance types -- dryers, water heaters, stoves and furnaces -- include the specific gravity of the gas, the maximum gas demand and the allowable pressure loss from the point at which the gas is delivered to the appliance. The length of the pipe and the number of required fittings you will need also have a bearing upon the size of the piping you select. The minimum input demand, or the capacity that the appliances must maintain in order to properly operate, determines the actual BTUs, or British thermal units, used by each of the four major appliances. This usage is measured in cubic feet per hour. The minimum BTU requirement of a gas dryer is 35,000 cubic feet per hour, while a water heater will require 35,000 to 50,000 BTUs, depending upon its size. 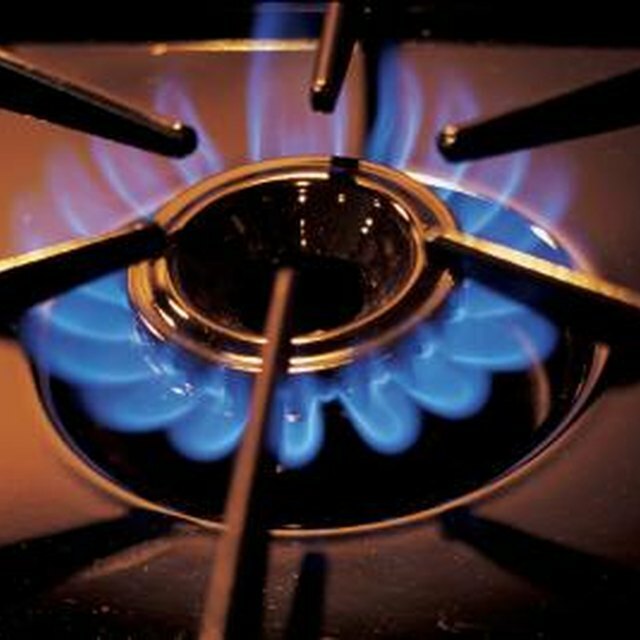 A gas oven will require a minimum of 65,000 BTUs. Whenever possible, a qualified professional familiar with local building codes should install gas piping for the major appliances in a home. Such a professional will be able to calculate the right amount of the right size of pipe. A pro will also know the right type of material. Generally, black or galvanized steel pipes are required, but wrought iron pipes can be used as well. Whichever type of pipe is used, the inside diameter of the pipe must be maintained when the pipe is cut in order to ensure proper delivery of gas. The size of the pipe used for appliance installation can range from 1/2 inch to 3 inches in diameter. The cubic feet per hour capacity of the line is proportional to both the diameter of the pipe and its length. For instance, 10 feet of 1/2-inch pipe will deliver 175 cubic feet of gas per hour, whereas 125 feet of that same pipe will deliver only 44 cubic feet. A 3-inch pipe will deliver 11,000 cubic feet per hour at 10 feet of distance, but only 2,950 cubic feet with 125 feet of pipe. What Is Schedule 40 Pipe?